So… here we are. I have decided to take the plunge into blogging. I hope this goes well! 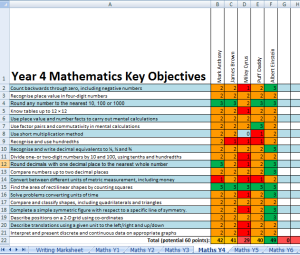 Just as term ended, Tim Clarke (@tim_jumpclarke) sent me an excel spreadsheet he had created to record assessment against the key objectives for Maths and Writing and Reading. After a few emails and a bit of tweaking, we’re releasing what will hopefully be a useful tool for schools choosing to use the Key Objectives approach. For each subject there is a spreadsheet covering all year groups (although it would, of course, be possible to combine sheets from different files to put, say all the Y5 pages into one document). Star Jar – During lessons throughout the Summer term each time I was pleased or impressed with a learner or group of learners I made a note and placed it into a large jar to be shared at the end of the term. The main reason for doing this was as a celebration at the end of the term, but it also has a positive effect on reinforcing the behaviours/attitudes/efforts of learners. This is just ridiculous stuff! But sadly completely believable…..starting to question my career choices. Re blogged from icing on the cake. I personally prefer teaching in sets but just recently I have been leaning towards mixed ability and this article definitely gave me some more food for thought…. I don’t often pick Sam up from school in the afternoons. Actually, that’s not strictly true, I do it most of the time, what I mean is, I don’t often fetch him on my bike. More often than not, when I meet him from school, I am festooned with other, younger children or I’m in a hurry to meet said younger children and I, rather to my shame, choose to travel via the car, squeezing the bike into the boot for the journey home.